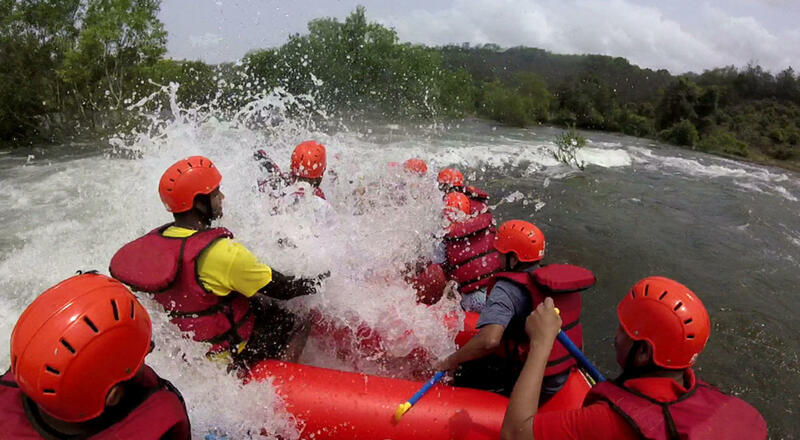 Enjoy an eventful day at Kolad with River Rafting. Kolad is located on the banks of Kundalika River failing under Roha Taluka in Raigad District. Distance from Mumbai and Pune is 110 kms and 100 kms (approx.) respectively. Kundalika River Rafting is being carried out since many years hassle free and safely. The water is released in to the river from nearby Dam, therefore making Kolad an ideal destination for river rafting throughout the year. Safety precautions are kept on utmost priority thus providing you Helmets, Life Jackets and Pedal for rafting. An instructor is also there on the raft to take up the responsibility of providing you a memorable experience. The stretch of Kundalika river rafting is of 12 kms enabling you to enjoy rafting for a whopping 2 hours (approx.). Post rafting session one can also enjoy various other activities such as Zipline, Burma Bridge, High Rope Course, Low Rope Course and many more to make most of your day. Also enjoy the local delicacies as we serve you with vegetarian and non-vegetarian dishes to revitalize your body. Meet at Pritam Hotel, Dadar at 5 am as we will proceed to Kolad for river rafting session. / Meet at Sancheti Hospital at 5 am as we will proceed to Kolad for river rafting session. Before we begin our adventure activity, we will have breakfast on our way to Kolad. We will reach Rafting Start point around 8 in the morning. Follow the instructions provided by the instructor as you gear up for the adventure activity. We will finish our rafting session around 11 am. We will proceed to our camp site to feast on local delicacies. We will head back to Mumbai/ Pune around 4 pm sharing our memorable experience with our fellow travellers. Dadar to Dadar Transport, Breakfast, River Rafting, Lunch, changing facility, Archery. At least 1 ltrs of drinking water. Team leader's decision will be final and binding.